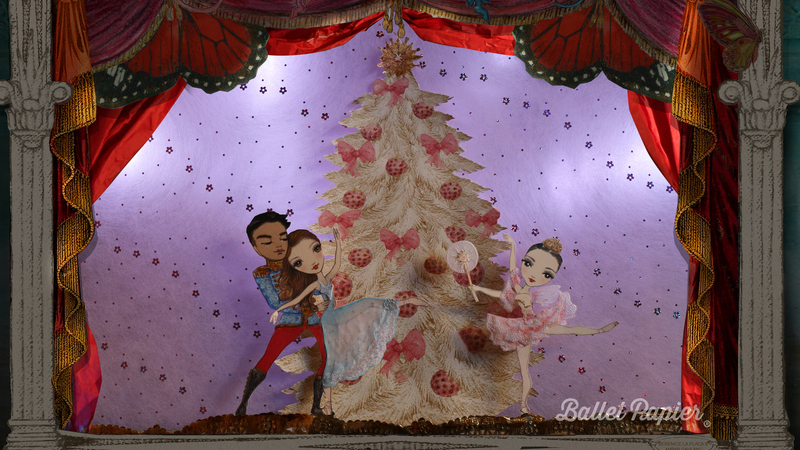 Christmas Day is here and Ballet Papier artist Berenice has got the season all wrapped up with the fabulously festive gift she has produced for fans of her work. 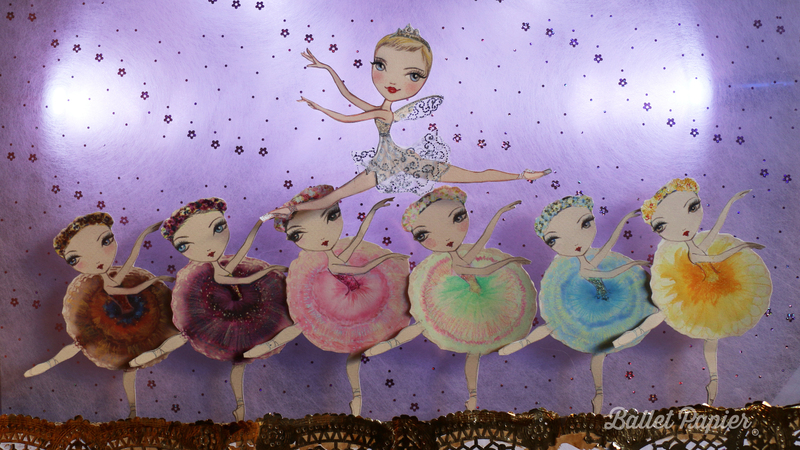 Inspired by real dancers from around the world, she has created a unique troupe of paper ballerinas to form the twinkle-toed Ballet Papier Company. After an audition process held via social media to decide the roles, the divinely drawn cast have now made their dazzling debut in an enchanting short movie of The Nutcracker. Magic is in the air from the moment the curtains open to reveal the first ever paper ballet company in action. This splendid film is a must-see showcase of Berenice’s talents and a wonderful keepsake for all involved. The Nutcracker is a Christmas favourite and as traditional as mince pies, turkey and all the trimmings. It is a ballet about childhood, make-believe and dreams coming true. Nothing could be more fitting for this time of year. We join the Stahlbaum family on Christmas Eve as Clara, her younger brother Fritz and their parents are preparing to welcome family and friends for a party. The guests arrive and the celebrations begin in earnest. As everyone exchanges presents, Clara’s godfather – the mysterious magician and toy-maker Dr. Drosselmeyer – enters. He amazes all of the children with his lifelike toys and gives Clara a very special present: a painted wooden Nutcracker. Clara is delighted with her new doll and dances with it happily. A jealous Fritz tries to grab it from her and, much to her dismay, manages to break it. Fortunately, Dr. Drosselmeyer is able to repair Clara’s beloved Nutcracker before the end of the party. Later that night, Clara creeps downstairs. The clock strikes midnight and, all of a sudden, the Christmas tree starts to grow taller and taller. The living room is abruptly transformed into a battlefield as a gang of mice, led by the evil Mouse King, threatens to capture Clara. As she begins to tremble with fear, an army of toy soldiers miraculously snaps to attention. Under the command of the Nutcracker, the soldiers fight to defend her. When it looks as if the mice may overpower the Nutcracker, Clara intervenes by throwing her slipper at the evil Mouse King. This startles the rodent for just long enough that the Nutcracker is able to defeat him. As a result of Clara’s selfless and courageous act, the Nutcracker becomes a handsome prince and the duo are whisked off on an astounding adventure. They journey through the glistening Land of Snow, before encountering an assortment of captivating characters in the exquisite Kingdom of Sweets. Here, divertissement delicacies dance in a celebratory procession to acknowledge Clara’s bravery. The Ballet Papier Company has been meticulously hand-drawn by Berenice (who is also known as María La Placa) to resemble each individual real-life balletomane. The paper dancers are adorned in stunning costumes and the attention to detail is incredible. Each dancer was drawn in a variety of positions to ingeniously depict them dancing. After cutting out the individual characters in various poses, Berenice and her Ballet Papier co-star (and daughter) Ambar set to work imaginatively placing them on backgrounds and painstakingly capturing images to build up the movie. With the addition of The Nutcracker ballet’s distinctive music, the film is a joy to watch. 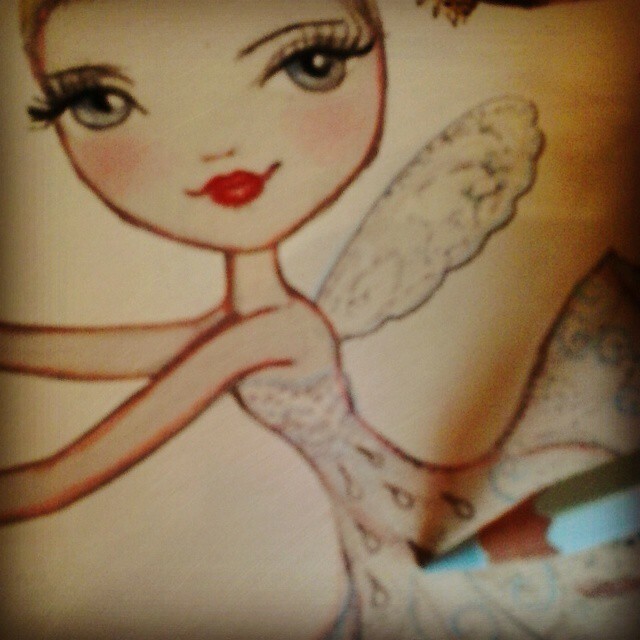 I am honoured to be included in the line-up as the elegant Dew Drop Fairy. Dew Drop leads a bouquet of candied flowers in a lilting waltz, gracefully weaving through the colourful blossoms. I also penned the on-screen words to help make the fantasy tale of The Nutcracker accessible to everyone. This means that I now have two movie credits to my name – fancy that! The Ballet Papier Company‘s production of The Nutcracker is a huge achievement for Berenice and Ambar – and I am thrilled to have been invited to be involved. We are all now enjoying a well-earned break over Christmas but as we look ahead to the new year, I can’t wait to see what Ballet Papier will do next! Here is the Ballet Papier Company performing The Waltz of the Flowers, an extract from The Nutcracker. Starring Georgina Butler as the Dew Drop Fairy! Here is the Ballet Papier Company performing The Nutcracker. Enjoy! > Discover the beautiful world of Ballet Papier – where ballet is the passion that unites us all! Merry Christmass Georgina Butler from Barcelona! Thank you for reading and commenting and Merry Christmas to you too Ana! Berenice is indeed very talented 🙂 and I love that dance can bring us together, wherever we are in the world!